PDF version of Cyprian Rift: Warships!! Updated rules, are completed! Cyprian Rift: Warship Version 2.0 is released. Cyprian Rift: Warships is an action packed starship miniatures game! As commander you take charge of your task force of Corvettes, Frigates, Destroyers, and Cruisers to run covert shadow missions thru the Cyprian Rift. Those bold enough to enter the precarious rift have the chance to explore the mysterious pocket universe that lay beyond. Mysterious dead worlds and lost ancient technology abound in the pocket universe, ripe for the picking. However, yours isn’t the only Faction intent on the prize! You must battle your way through enemy ships intent on your destruction while traversing a bizarre and unpredictable maze of conduits filled with incomprehensible galactic events, obstacles, and obstructions that will challenge your tactical genius every step of the way. 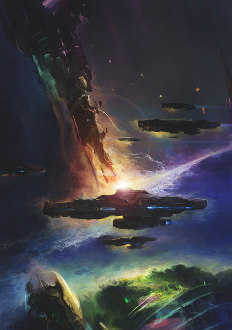 In the Cyprian Rift is where your Legacy will begin…or where your name will be forgotten; another insignificant casualty to the galactic battle for power. Do you have what it takes to enter the rift? More importantly, do you have what it takes to survive! ?